If you are looking for a small but mighty air purifier the Amazon Choice product by Levoit is just the thing. This air purifier will, of course, tackle pet hair, dander, and smells but it also will free the air of any smoke, dust, pollen, and beyond giving you safe and fresh breathing air. This model works great in small to medium-sized rooms and has a soothing nightlight that makes it ideal for the bedroom. Reviewers agree that this unit is small but mighty. Many say they've seen their allergy symptoms improve just one night after using this. One customer who fosters kittens said this was one of the only things that took the smell out of her house. A few say that this is a bit loud so if sounds bother you might want to try another option on the list. If you’re ready to make a serious investment in your air purifier, Alen BreatheSmart has a pedigree that’s worth the steep price tag. Designed by NASA airflow engineers, it’s capable of cleaning the air in spaces up to 1,100 square feet and features four filter options, each suited to different tasks. Choose the one with odor-controlling technology to take care of even the toughest, longest-lingering smells. This model also comes in 16 different color options so you can choose something that blends into your decor seamlessly. Customers rave that it’s the “mac daddy of air purifiers,” and is worth every penny. One reviewer with multiple dogs adds that it’s worked wonders for their home, and successfully eliminated pet odors that have long kept visitors at bay. The Germ Guardian Elite features a True HEPA filter which is your best defense against pet dander, the most common cause of pet allergies. This air purifier captures 99.97 percent of allergens while the “Pet Pure” antimicrobial agent helps stop the growth of mold, bacteria, and mildew on the surface of the filter. It is 22 inches tall, features three speeds, and is perfect for small to medium rooms between 100 and 300 square feet. Each filter lasts six to nine months and owners say the Germ Guardian Elite is effective at reducing allergies and odors. It also comes with a 3-year limited warranty against defects and failures. It also runs at a quiet level so it won't disturb you when you sleep. If pet hair is your biggest concern, the Hamilton Beach Air Purifier features a three filtration process with a permanent pre-filter that targets pet hair and other large airborne particles. In addition to the permanent filter, this purifier has two carbon zeolite filters that reduce pet odors and eliminate common allergens. All you need to do to clean the filter is vacuum it and you are on your way to pet hair free air. It’s effective for rooms up to 140 square feet and measures 10.8 x 8.1 x 16.4 inches. The permanent 99 percent HEPA-grade filter vacuums clean for easy upkeep. Amazon owners love how economical the Hamilton Beach Air Purifier is, noting that they save money on pricey filters (up to $49 a year). This is a great air purifier if you find yourself constantly chasing after floating pet hair. Whether you own a loft or you simply want to purchase a single air purifier for most of your home, the AIRMEGA 400 is one of the most effective large-space purifiers out there. This workhorse can reach up to 1,560 square feet and features a dual-filtration system to reduce up to 99.97 percent of airborne matter, including pet hair, molds, dust, and dander. It measures 14.8 x 14.8 x 22.8 percent and weighs just under 25 pounds. The ultra-quiet system works on its own, recognizing when air quality is poor or good and adjusting as needed. The sleep mode can also detect when it’s dark and will turn on the quietest fan during nighttime hours. One owner said the AIRMEGA made a six pet household smell like a pet-free space. Reviewers also like the quiet fan and the smart mode that adjusts throughout the day. Though all air purifiers can be used 12 months out of the year, the Dyson Pure Hot + Cool Link Air Purifier comes with a nifty extra feature—it can help heat a room too. This purifier removes up to 99.7 percent of small particles and allergens in the air and can cover rooms up to 400 square feet. The activated carbon granules in the filter capture pet odors and the “Air Multiplier” technology circulates air in even large rooms. But its most unique feature is the ability to cool in the summer and heat with thermostat control in the winter. Though the Dyson is pricy, owners say it’s durable, dependable and well worth the cost. Many reviewers say that on top of reducing pet allergies and dust in the air, it’s aesthetically pleasing—which is always a plus when it’s in the main space in your house. If white noise isn’t your thing, you may struggle with using an air purifier. The Rabbit Air BioGS 2.0 Ultra Quiet HEPA Air Purifier is a great alternative that features an ultra-quiet BLDC motor that, at its lowest speed, is virtually silent. It can filter allergens from rooms as large as 625 square feet up to twice an hour. 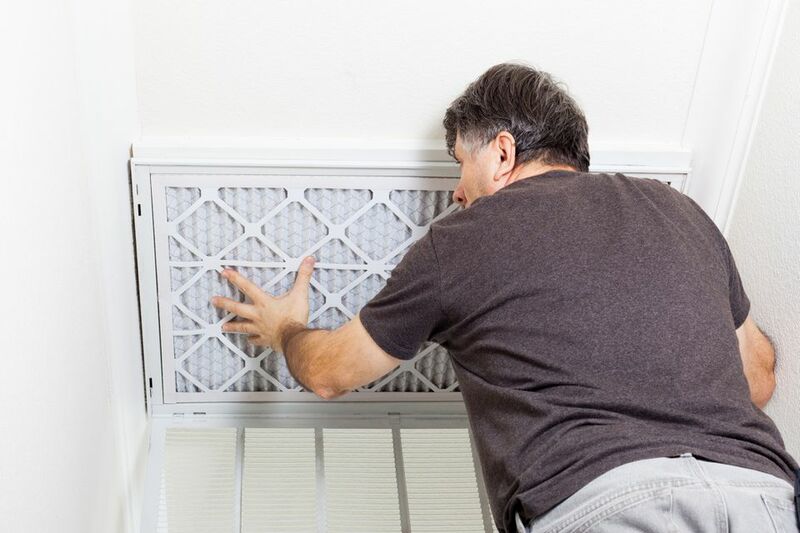 The HEPA filter can trap up to 99.97 percent of allergens, including pet dander. With a top rating on Amazon, the Rabbit is definitely a fan favorite. Though the unit can filter up to 625 square feet, owners say it’s better for small to medium-size rooms and best in a bedroom. Owners say the sound is undetectable and allergies are instantly reduced with this handy little machine. Looking for an air purifier that’s made for the internet age? The Blueair Classic combines best-in-class cleaning with smart home technology, allowing you to use voice assistants like Amazon’s Alexa to set it into action. It’s also super quiet, allowing you to sleep without disruption while it works, and Energy Star-rated—so it won’t take a toll on your energy bill. The HEPA filtration system captures 99.97 percent of airborne particles. Customers say that while the Blueair has a high price tag, it’s virtually paid for itself in terms of money saved on allergy medicine. They also say it’s far quieter than many of its competitors—on its lowest setting, it’s virtually inaudible. If you want powerful cleaning in a small package, BeeMoon’s compact air cleaner is your best bet. Despite its small size (9.9 x 7.8 x 7.7 inches), it removes 99 percent of pollutants–even the smallest kinds, like pet dander, and pollen. The streamlined design uses a single button to toggle between two fan speeds, and it’s quiet to boot, emitting fewer than 60 decibels. Customers call out the fact that the BeeMoon’s filters are fully washable, saving them the expense of purchasing new ones every few months. For its size, they write, it’s surprisingly effective. The only gripe is that the power light cannot be turned off—some recommend covering it up if you’re using the purifier in a bedroom.